…thanks to all the boxes shoved in here. We’re getting our apartment renovated this week which means living in chaos. My desktop had to be dismantled and moved. It’s currently not hooked up so I don’t know how active I will be this week. To top it all off I have homework and a vending gig to prepare for. The craziness never ends. Although I know my blog will be fine, and although my main altar (thankfully) is undisturbed, my poor DP mentee has been waiting for more feedback for awhile. I feel simply awful about making him wait. He’s very patient and good-mannered. He deserves more attention than I have been able to give. If I have any free time and access to my husband’s computer, my goal is to finish looking through my mentee’s work. Though I may post bits and bobs with the help of my phone, don’t expect any substantial entries for a week or so. I’ve got some drafts and ideas on the back-burner. Now if you’ll excuse me, I really, really need a cup of tea. 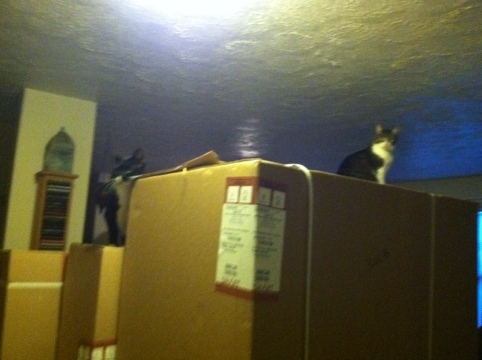 Love the cats, on the very top of things! I’ve got my very own Pride Rock! I am sure that it will all be so worth it when done…and the kitty has a new playground in the interim! !